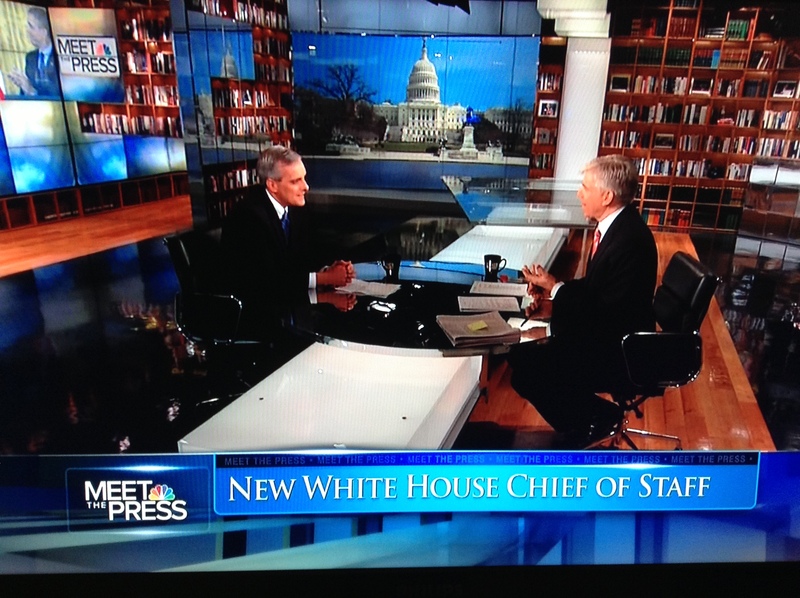 This Week’s Meet the Press began with new White House Chief of Staff Denis McDonough. Host David Gregory covered some highlights of McDonough’s political biography. Moving on to the sequester, Gregory quoted Speaker of the House John Boehner as saying that President Obama doesn’t have the “guts” to take on spending and the liberals. McDonough recalled that the president has already accomplished $2.5 trillion in debt reduction and there’s another $1.5 trillion in cuts set to be made if Congress will cooperate. Gregory pushed McDonough on Obama’s earlier statements that the sequester simply will not happen. The most McDonough could say at this point is to say that he “hopes” it doesn’t happen. On Medicare, McDonough seemed to reject the idea of raising the age for benefits. On immigration reform and gun control, no new ground was broken. In what is becoming a new pattern on Meet the Press, Gregory stopped between the two main interviews of the day to do a brief discussion with the political roundtable. MSNBC’s Chris Matthews said Hagel has been damaged by the confirmation battle, but he was helped when Senator Ted Cruz (R-TX) went overboard in his criticism and embarrassed other Republicans. Next up, Senator John McCain (R-AZ) discussed the Hagel nomination. Gregory played a video of McCain saying some very tough things about Hagel and then asked McCain if this battle was now personal. McCain said no and called Hagel a friend of his. With friends like this, who needs enemies? In the end, McCain believes Hagel will be confirmed. Regarding Benghazi, McCain still has a long list of questions he thinks needs to be answered. Gregory pushed McCain to answer what he thought the worst case scenario here might be. In other words, what does McCain think is being covered up? This devolved into a near shouting match between Gregory and McCain, but no new ground was covered. There was also no new ground on the sequester. Regarding immigration reform, McCain said some Republicans wonder if the president really wants a deal. “Does the president really want a result or does he want another cudgel to beat up Republicans and get political advantage in the next election?,” asked McCain. Back in the roundtable, Lieutenant Governor Gavin Newsom (D-CA) said the Hagel matter seems to be a “personal grudge match” for McCain. Former Hewlett-Packard CEO Carly Fiorina said the bipartisan agreement on immigration reform is “delicately balanced” and could pass, but she predicted it will fail if the right in Congress or the president try to push it one way or the other in order to gain political advantage. In one of my all time favorite Meet The Press quotes, Newsom said, “You want to move the mouse, you have to move the cheese.” I am not sure what he was referring to, but it sounds good. GOP strategist Alex Castellano said, “I think the president’s priority is social justice.” He did not seem to mean that in a very positive way. The program ended with one of my favorite new figures on the political scene, retired US Navy Captain Mark Kelly. Kelly, former commander of the International Space Station, is the husband of former Representative Gabrielle Giffords (D-AZ) and now co-founder of a group advocating for reform of gun laws, Americans for Responsible Solutions. He and the organization seem focused on very pragmatic, politically viable reforms. He says universal criminal background checks for gun buyers is their top priority. Sunday 2/17 David was a complete wimp interviewing McCain. McCain was at his usual snarly snearing self. David asked pointed questions and McCain avoided answering, just went on his rant. Even when David pushed, McCain talked (shouted) over him and kep his rant going. Get some spine, David. Push the guest for answers.